A beautiful song about immigration. The flowers, in part, symbolize all of the Poles that have left, been born or grown up outside of Poland. It talks of the longing, the journey, and the hardships of having to live so far away, and yet, it talks about the beauty of the flowers, their perseverance, and how the heart remembers their gentle nature, out in the open fields. It speaks to all of us, who have once upon a time left Poland, and whether we are near or far, we take with us a piece of Poland, and remember the motherland through the flowers. Polish Spisz is located between the border of the Polish-Slovak in the South, the river Biała in the West and North, and the river Dunajec in the North-East. The area of the region is 195.5 km². Beautiful mountainous region characterized by rolling pasture land and small townships, where to this day you can experience a true cultural experience. An old wooden church in Jurgow is one of many popular tourist destinations. This highlands region of Poland is both unique in its culture, tradition and ethnography. Spisz is a small region of Poland that has been influenced throughout the history by the Hungarian, Czekoslovakian as well as Polish cultures. 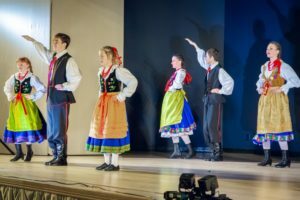 Today, it stands as a unique ethnographic region, where the music, dance and song bring forth the very best of Czechoslovakia, Hungary and of course Poland. This influence is seen also in our costumes today, especially in the way the girls and boys vests are embroidered and the hats that the boys wear. Krakusy perform a medley of Spisz dances, where you can experience the beautiful music, characteristic songs, and steps that interchange from steady and soft to quick and bouncy. Many spins, intricate footwork for both boys and girls and much fun ! This traditional polish song, originates in the central regions of Poland, but has been sang in many other regions. It talks about a friendship between a boy and a girl, and the longing to see each other, as well as the fact that there are sometimes squabbles, like in any relationship. Throughout the history, this song has been very versatile being performed as a slow waltz, a polka, and an oberek, all three distinctly different dances. It has also been sang from both the perspective of the boy as well as the girl. The Kaszuby Province lies in the northern edge of Poland. It spreads over south and west from the sea port of Gdanski on the Baltic Sea and covers an extensive area of varying landscapes – from sand dunes to forests and hills, as well as beautiful lakes. The most important feature of the Kaszuby region is the thousands of lakes that abound the area. It is because of these lakes it is also called the Kashubian Lakeland. Marked by a strong ethnic culture, the Kaszuby region has been the heart of fishing and farming for long time. The natives speak their own language – Kashubi. The place is also famous for its folk culture and porcelain & pottery manufacturing. The Kaszuby Province is marked by small villages and the many lakes around which tourism has built up. They say “wherever you throw a stone in Kashubia, it will land in water”. It is in the dance as well that you notice the beautiful flowing music, as if water was flowing in the background. You will note gentle steps intermixed with lively portions as both boys and girls showcase their abilities. The Kaszubski costume is well known for its colour scheme of blue, red and white with some yellow or orange. The costumes, handmade and embroidered are a pride of that region. The headpieces worn by the girls symbolize that they are still maidens, and not yet married. Should they get married in the future, their hair would completely be covered by a Chusta. Slask taniec originates from the South Western regions of Poland, called Silesia. The region is rich in mineral and natural resources, and includes several important industrial areas. Silesia’s largest city and historical capital is Wrocław. The biggest metropolitan area is the Upper Silesian metropolitan area, the centre of which is Katowice. It is here that the borders changed several times throughout the course of Poland’s history, and today this region is rich in it culture and ethnography. This is the region where the mining industry is prevalent to this day, and the richness of that natural resource – coal. It is around that line of work that many songs and dances are originating. The famous dance called Trojak, which is danced in threes, has a very interesting fact attached to it. Why was it danced in threes? It is because so many young men worked as miners and some may have perished in mines as well. The men that remained danced together with the girls, and because there were more ladies than men, the dance Trojak features one man dancing with two ladies. Similarly, the song called Gaska talks about a girl singing to her beloved Jasiu who works in the mines, deep below the earth. She asks the stars and the sun to grant their light so that the bird that fly above the mine may somehow deliver their shine to the deep darkness of the mines. Once again – the beautiful costumes are characterized by rich colours for the girls and black for the boys, which was the colour of the mining uniform. Polka is a fun lively dance, which today is popular across the world. In Poland it finds its roots around the central regions of Poland – around Warsaw. The famous Polka Warszawska is known for its fun, showcasing of various talents and fast moving choreography. The largest city in Poland, and its capital, Warsaw has emerged from its ruins of WWII, like a Phoenix from its ashes, to become a thriving metropolis, with plenty of sights to see, albeit many linked to the Warsaw Uprising and WWII, a vibrant cultural scene and an increasingly lively nightlife. Today Krakusy both younger and older showcase their Polkas during their performances. The children and youth really enjoy this dance, as it is fast paced, fun and includes some tricks. Carpathian mountains (Eastern and Western Beskid), still rich in forests and lovely valleys, runs along the southern border of Poland. Villages there are inhabited by highlanders’ groups whose ethnographic names mostly coincide with geographic terms referring to particular mountain areas. Wonderful nature, isolation from urban centers and memory of “fathers’ life” – all these helped to preserve traditional folk customs, despite changing life conditions and infiltration of culturally strange elements. Beskid Slaski is an amazing and authentic representation of Polish dance of the highlanders. 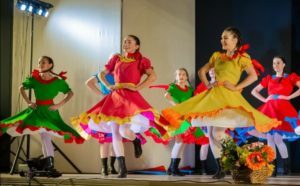 Authentic songs, footwork, tricks by men, and girls’ dance Kolomajki, are but a few special elements of this region. 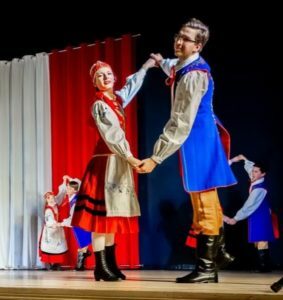 Simple yet beautiful costumes along with lively music enable the viewer to be transformed in time – back to the pastures of Beskid Slaski in Poland. 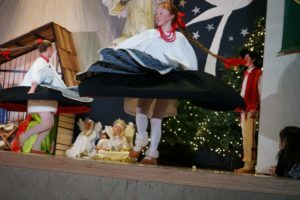 The Krakowiak is a fast, syncopated Polish folk dance from the region of Kraków and Lesser Poland.The folk outfit worn for the dance has become the national costume of Poland, most notably, the rogatywka peaked hat with peacock feathers. One of five of Poland’s national dances, it stands uniquely among the other four. The beautiful vibrant costumes, for both girls and boys, symbolize the beauty of Krakow and the region where it originates. The more colorful and decorated the costume, the wealthier the person wearing it. Krakowiak became a popular ballroom dance in Vienna (“Krakauer”) and Paris (“Cracovienne”) where, with the polonaise and the mazurka, it signaled a Romantic sensibility of sympathy towards a picturesque, distant yet often oppressed nation. It soon became an identifiable symbol of Poles and Polish culture in Poland and abroad, especially due to the rogatywka hat which you will have a chance to see today, being worn by the boys.